Looking for a New Subaru Ascent in your area? CarGurus has 634 nationwide Subaru Ascent dealers with 39,459 new car listings. With the Ascent, Subaru customers finally have a high-tech, capable, and safe 3-row SUV they won't outgrow. There are certain vehicle types every major automaker needs to offer if they plan to be taken seriously. The largest automakers are able to offer a full spread of vehicles, from sports cars to full-size trucks. Not every automaker will be able to fulfill every vehicle segment, but if you are a growing automaker, offering a 3-row family-hauling SUV is a must. Because of this, the 3-row segment is getting pretty saturated. From cornerstone vehicles like the Toyota Highlander, Honda Pilot, Nissan Pathfinder, and Ford Explorer to alternatives like the Kia Sorento, Buick Enclave, Chevy Traverse, Dodge Durango, Mazda CX-9, Volkswagen Atlas, and Hyundai Santa Fe, the list of 3-row SUVs seems exhaustive… because it is! Enter the 2019 Subaru Ascent. Like all the vehicles listed here, it is a midsize SUV capable of seating 7 or 8 passengers, depending on the configuration. It's clearly designed for families, and it begs the question: How does this newcomer stand out in such a crowded space? First, a bit of background—the 2019 Ascent isn’t Subaru’s first stab at a 3-row SUV. That distinction would go to the B9 Tribeca, later shortened to just Tribeca. That car was produced from 2006 to 2014, and felt half-baked the entire time. It had minimal cargo space, poor fuel economy, and an almost nonexistent third row. In addition, for its first two years, the B9 Tribeca had a face only a mother could love. 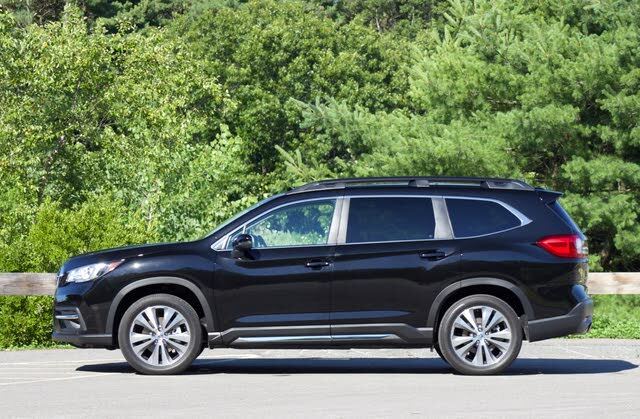 The 2019 Ascent is not the Tribeca. It is a full and honest effort featuring big, bold styling, plenty of cargo and passenger space, and the latest infotainment and driver-assistance technologies. It has an upright design with a commanding presence, pronounced fenders, and an imposing grille. The Ascent has a wheelbase of 113.8 inches, making it the largest Subaru passenger vehicle ever built. But in many ways, from the characteristic headlights to the upright layout, it looks like a scaled-up Subaru Forester. But climb inside and it feels more like an extra-large Subaru Outback than a Forester. The cabin boasts plenty of space for occupants, with the option of either a 7-passenger layout with second-row captain’s chairs or an 8-passenger layout with a second-row bench. Trims for the Ascent are Base, Premium, Limited, and Touring. The Base and Premium trims come standard with the bench, although the Premium has the option of the captain's chairs. The Limited has the choice of either as well, while the Touring comes equipped with only the captain's chairs. Starting with the Base trim again, the Ascent comes well equipped with 18-inch alloy wheels, roof rails, satellite radio, Bluetooth connectivity, 4 USB ports, and 19 cupholders. It also features 3-zone climate control with vents for all 3 rows (not always a given in these family haulers). Moving up to the Premium nets the buyer features like a windshield de-icer, an 8-way power-adjustable driver’s seat, heated front seats, a leather-wrapped steering wheel and shift knob, and upgraded stain-resistant cloth upholstery. It also comes with 4G LTE Wi-Fi capability, second-row climate controls, an upgraded 8-inch touchscreen infotainment system, and blind-spot monitoring with rear cross-traffic alert. I drove the Limited, which came standard with 20-inch alloy wheels, LED headlights that respond to steering inputs, and a power liftgate. 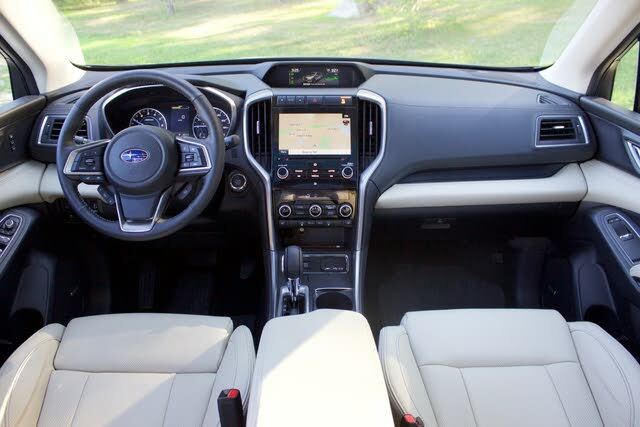 It also features leather seating, heated first- and second-row seats, a heated steering wheel, and ivory leather interior accent trim on the dash and doors for a more premium, soft-touch feel in the cabin. The Limited doesn’t stop there, as it also features remote keyless entry with push-button start, an auto-dimming rear-view mirror, and additional second- and third-row USB ports. It even came with helpful driver-assistance features like automatic high beams and reverse automatic emergency braking. Our Limited trim had the available Technology Package, which adds a navigation system, panoramic moonroof, and a Harman Kardon premium audio system—all of which are standard on the range-topping Touring trim. Additionally, the Touring features satin chrome side mirrors with integrated turn signals, chrome door handles, ventilated front seats, and woodgrain interior accent panels. Rounding out the Touring’s list of features are an upgraded auto-dimming rear-view mirror with HomeLink buttons, a 120-volt wall-style power outlet, and a 180-degree front-view camera. The turbo engine provides plenty of pickup—owners will be impressed in both city and highway driving. On top of that, it’s good to see Subaru didn't skimp on the lower trims when it comes to engine selection. Take the Toyota Highlander, for example. If you go for the base LE trim of the Highlander, it comes with an uninspiring 4-cylinder engine that strains to get up to speed. Steering is well weighted, though it may feel a little light for drivers used to the Outback. Cornering is precise, and there is not a lot of body roll when taking a corner at speed. Like the Outback and Forester, the Ascent has 8.7 inches of ground clearance. But only the Ascent can offer up to 5,000 pounds of available towing capacity—the most ever for a Subaru. Take note, however, that this requires a tow-prep package. Without it, towing capacity falls to 2,000 pounds. The combination of towing and ground clearance brings up an interesting point. In some ways, Subaru has maintained its unique DNA with the Ascent, but it also gives brand loyalists a new, larger, and more capable vehicle if they've outgrown Subaru's other models. So if your family is getting too big for an Outback or you need more towing capacity than that of a Forester, the Ascent allows you to upgrade without having to look to other brands—something that was impossible before the Ascent. Fuel economy for the 2019 Subaru Ascent is 21 mpg city, 27 highway, 23 combined. Opting for the Limited or Touring trim will bring mileage down to 20/26/22. In my week of mixed city and highway driving, the Limited test model returned fuel economy of 22.7 mpg. Both the first and second rows offer plenty of legroom and headroom, while the third row is a bit tighter for full-size adults. I had to strain to get into the third row for even a few minutes (see our video review for the uncomfortable results), a tight third row is not necessarily a deal-breaker in this segment. That rear row is mostly for moving kids around town, or it gets dropped to make more room for gear. In this way, 3-row SUVs are a lot like minivans. Also consider that some of the most popular 3-row SUVs, including the Toyota Highlander, are tight on third-row space. But if you feel you need an SUV with an adult-friendly third row, check out the Honda Pilot or Volkswagen Atlas. And we have to point out again that the Ascent has 19 cupholders. You'll find them in all manner of cubbies and pockets spread around the cabin, making the Ascent incredibly useful for a road trip. 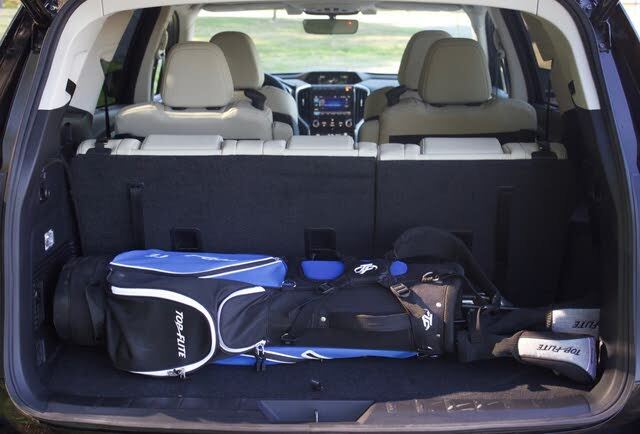 Dropping the third row provides 47 cubic feet of cargo space, which grows to 86 cubic feet if you drop all the rear seats. That’s more than the Ford Explorer, the Highlander, and the Pilot, and it's downright impressive. 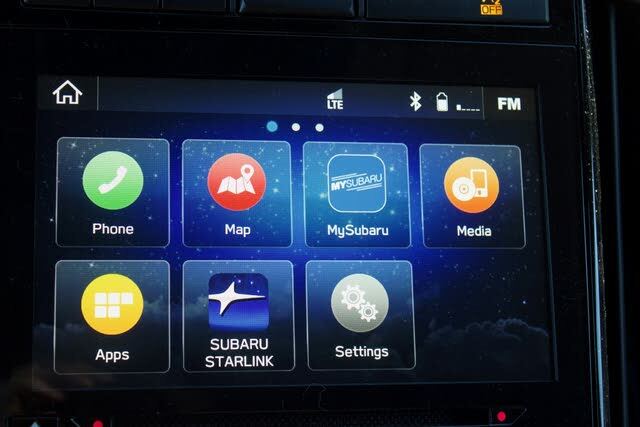 The Ascent comes standard with the latest version of Subaru’s StarLink infotainment system. The base trim gets a 6.5-inch touchscreen with Apple CarPlay and Android Auto, while all other trims get a larger 8-inch touchscreen. StarLink has easy-to-follow menus and redundant physical buttons for radio, maps, apps, and media, as well as real dials for volume and tuning. This allows for a minimal learning curve when getting into the Ascent for the first time. As stated earlier, our test model came with the optional Technology Package. It adds $2,950 to the price of our Limited trim and adds a Harman Kardon premium stereo, panoramic moonroof, navigation, and real-time traffic and weather updates. Of course, you can also connect your smartphone via USB and use Apple CarPlay or Android Auto, and access contacts, messages, music, maps, and more on your phone. A full array of front- and side-impact airbags come as standard equipment, as do vehicle dynamics control and a tire pressure monitoring system. Impressively, Subaru also offers its EyeSight driver-assist technology as standard equipment on all trims. EyeSight includes pre-collision braking, adaptive cruise control, and lane-departure warning. It means every Ascent buyer can enjoy peace of mind on the road, no matter their budget. This is a first for Subaru, but it follows a growing market trend. For example, Toyota makes its TSS-P (Toyota Safety Sense-Pedestrian) system standard equipment in the Corolla, Camry, RAV4, Highlander, and others. EyeSight will also be standard on the 2019 Outback; expect it to become standard in more Subaru vehicles in the future. The Premium, Limited, and Touring also come with blind-spot detection and rear cross-traffic alert. The Limited and Touring come standard with automatic high beams and reverse automatic emergency braking. 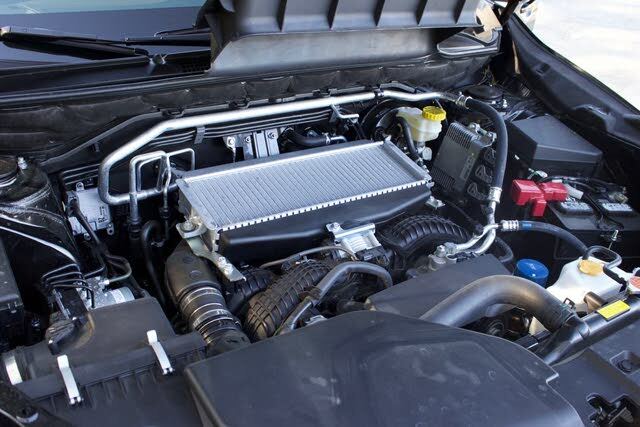 On top of all this, the Ascent is backed by a 5-year/60,000-mile powertrain warranty. Base MSRP for a 2019 Subaru Ascent is $31,995. The Premium starts at $34,195, the Limited starts at $38,995, and the range-topping Touring trim starts at $44,695. Our Limited test model with the optional Technology Package came in at $42,920. Some buyers might balk at paying that much for a Subaru, but that pricing puts it in the same neighborhood as the Toyota Highlander and Honda Pilot. 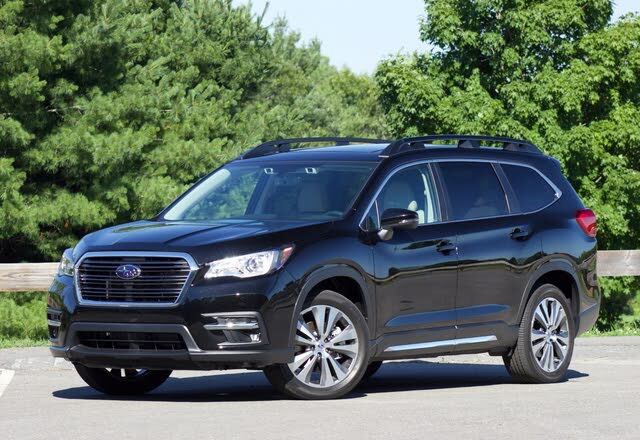 Just as importantly, there has never been a Subaru quite like the Ascent, and while this vehicle will be attractive to anyone shopping for a 3-row SUV, it will be especially interesting to Subaru owners looking to upgrade. For some, this vehicle was a long time coming, and one could argue it was long overdue, considering how well Subaru makes practical vehicles. Yet until now, the brand didn’t have a vehicle large enough to accommodate growing families, so it developed the Ascent and infused it with all the features that keep Subaru owners loyal. What's your take on the 2019 Subaru Ascent? GuruXBBXH Premium fuel only suxs. GuruXMY44 I am curious why the fuel economy is the same as the 6 cylinder, Outback, Pilot and Highlander-when the Ascent is a 4 cylinder? Getoffmylawn1 The number of cylinders doesn't matter. It's the vehicle weight, aerodynamic and horsepower that are the major factors in determining fuel economy. Getoffmylawn1 We've had our Touring for a couple of months now and put over 4000 miles on it. The previous car was a BMW X5 and honestly I like this Subaru better. It's more responsive, rides better, is quieter and will likely be more reliable. In response to the first post in this thread, it doesn't require premium fuel. It's perfectly happy on regular grade. Jason Only had mine for a couple of days and I like it with a few "buts". I came from a 2017 Outback. The steering on the Ascent IS a bit looser than the Outback. Not bad... but different. It feels less "homey" than the Outback. It feels beefier (which it is). The main thing that I don't like is there is no light on the roof in the cargo area. There is a sucky little light in a terrible position. If you have any gear in the back it will cover up the light and render it useless. The lights in the cabin help but they turn off when you only have the gate opened. You have to leave a door open to keep the lights on. What this all boils down to is you can't see what you're doing when it's dark outside and you're in the cargo area. Super big fail in my opinion. Also... so far the MPG's aren't matching what I am supposed to get. Oh!.... and the seats (in my opinion) aren't nearly as comfortable as the outback. So..... I kinda miss my Outback after a few days, but am going to give it a bit before I shed any tears. I upgraded to have better towing capability. Have you driven a 2019 Subaru Ascent? Enter your zip to see incentives for a new Ascent in your area. Looking for a Used Ascent in your area? CarGurus has 10,050 nationwide Ascent listings starting at $28,220. How do you get to the back seat in the 8 passenger model? If I have car seats in the middle, will I have to remove them in order for someone to access the back? I am a long term car buyer (9-10 year between new ones) The 2019 Sabaru Ascent is just out should I wait till the 2020 arrive or go ahead and but the 2019 one. 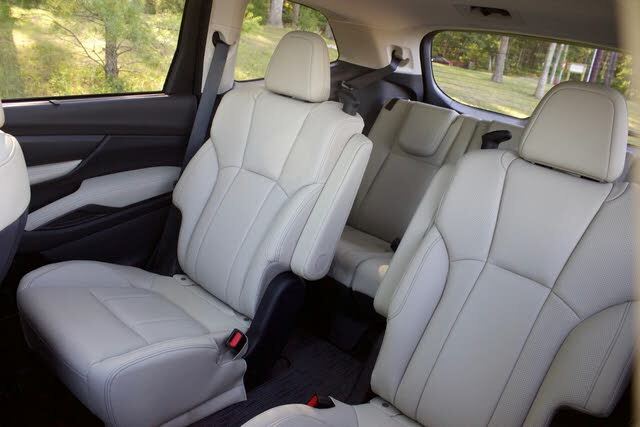 What kind of leather they use in Subaru Ascent?